If you’re headed into (or already in) the market for a job, you should know that the job outlook is one of the best it’s been in a long time. Just last year, unemployment was at its lowest in 50 years—and employers were scrambling to find quality candidates to fill their many open positions. This year, the hiring outlook is still looking good, and many top-rated companies are looking for eager candidates just like you across the nation. In fact, we put together a handy list of the Happiest Companies in America for 2019, based on thousands of actual employee reviews. 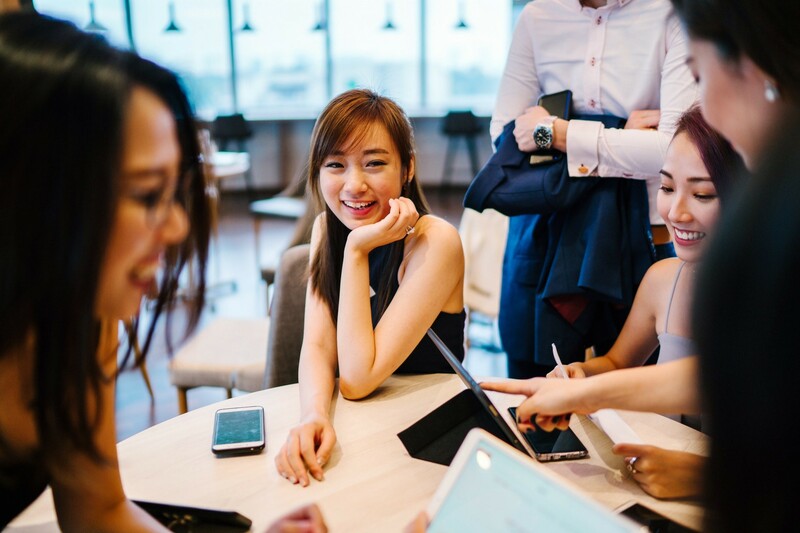 These happiness factors range across a number of considerations, including one's relationship with their boss, compensation packages, company culture, peer relationships and so much more. Are you ready to get into the running to work at one of the happiest companies in America for 2019? Here’s a list of the 10 happiest companies that are hiring now. Keller Williams, renowned real estate franchise, currently has more than 2000 open jobs spread out across the nation. From Receptionists and licensed Real Estate Agents/Associates (or Agent Trainees) to Team Leaders and more, Keller Williams was ranked high by employees, and may just be your next big career move. Why it’s a happy company: Keller Williams focuses on its agents first, offering a profit-sharing system to encourage hard work and personal ownership. With cutting-edge technology and education, the company stands behind its agents and associates, maintaining its reputation as the “real estate company of choice”. Check out open jobs at Keller Williams Realty here. Johnson & Johnson is renowned for its cutting-edge medical technology, first-aid kits, baby powders, and other products for mothers and their babies. The company has a great internship program for college students—and plenty of jobs across the nation in their family of companies—1,237 to be exact—ranging across bio-engineering, supply-chain management, product development, network systems, and pharmaceutical research. Why it’s a happy company: They have a great benefits package, including medical, vision and dental, along with life insurance, health savings account, disability coverage, auto and home insurance, commuter benefits program, accident insurance and tobacco cessation program. Check out open jobs at Johnson & Johnson here. If you’re in the tech industry, you’ve probably dreamt of working at Google at least once in your life—and for good reason. It’s been ranked as one of the top companies to work for time and again. The company’s 18 open jobs range from Head of Gaming Creators and Head of Government Affairs and Public Policy, Google Cloud Security to Linux Systems Administrator and Software Engineers. Why it’s a happy company: With an average salary of $70K (that’s 14% higher than the national average), a great company culture, indoors slides and sleeping pods, and some of the brightest minds in the nation, Google is an exciting place to work. Check out open jobs at Google here. The credit card company, Visa, currently has 133 open jobs. With an average salary of $85K and a happiness rating of 4.1 out of 5, we’re digging the opportunities abounding for anyone looking for a blissful job. Do you have technical, managerial/leadership or financial skills? You may have just found your dream job. Why it’s a happy company: Visa offers health care package benefits, retirement plan, life insurance and holiday and paid time off. The competitive pay and employee reward programs ensure employees feel valued and driven to achieve. Check out open jobs at Visa here. Communication matters and Qualcomm knows it. The communications company markets, manufactures and creates products that enable wireless communications—and provide a number of services to that end. The telecommunications industry is exciting because it's constantly evolving. So if you are a techie who thrives on the cutting edge, this may just be the place for you. Why it’s a happy company: Innovation and employee strengths are vital to the company’s success. Managers utilize the abilities of their team and strive to create a workplace that exhibits dedication, cooperation, and innovation. Despite the sometimes high-stress environment, employees receive high salaries, great benefits package including medical, dental, stock purchase plan, employer contributions to their 401(k), paid holidays, ongoing education and training opportunities and adoption assistance. Check out open jobs at Qualcomm here.